Box Size: 11⅞ x 5&frac18; x ⅞ in. Includes 10 durable plastic shapes; 18 coated, looped wires for easy assembly; and hanger and filament for suspending. Designed for balance and plenty of movement. 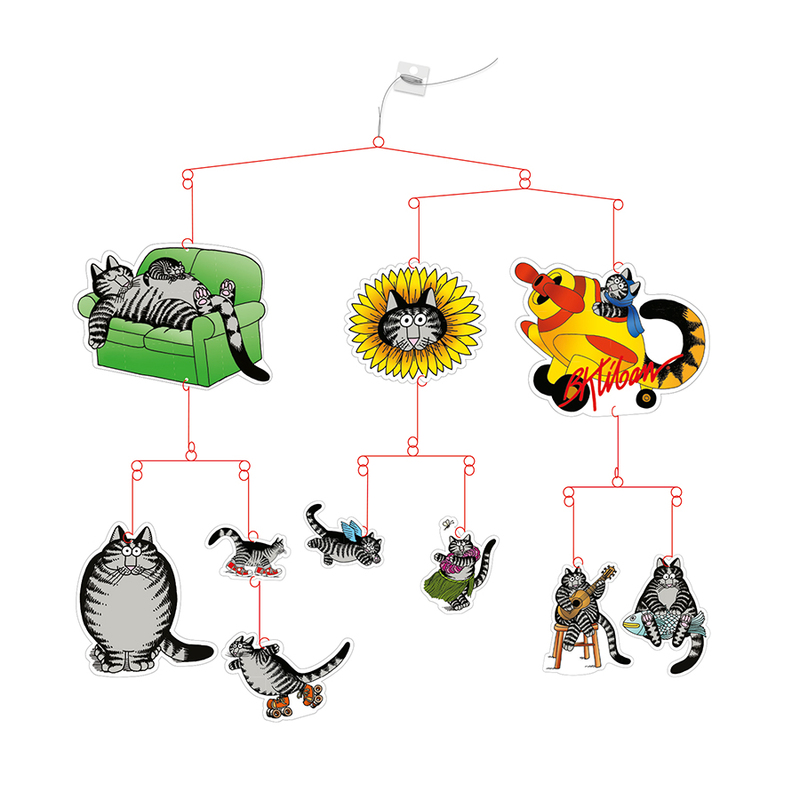 Bring a little kitty quirkiness to life with this mobile featuring the art of B. Kliban! American artist B. Kliban (1935–1990) loved cats and had several as housemates. Their stylishly goofy antics inspired him to create Cat in the early 1970s. With his fine sense of the absurd and his deft cartooning style, Kliban made sure hilarity and mild mischief followed Cat wherever he appeared. 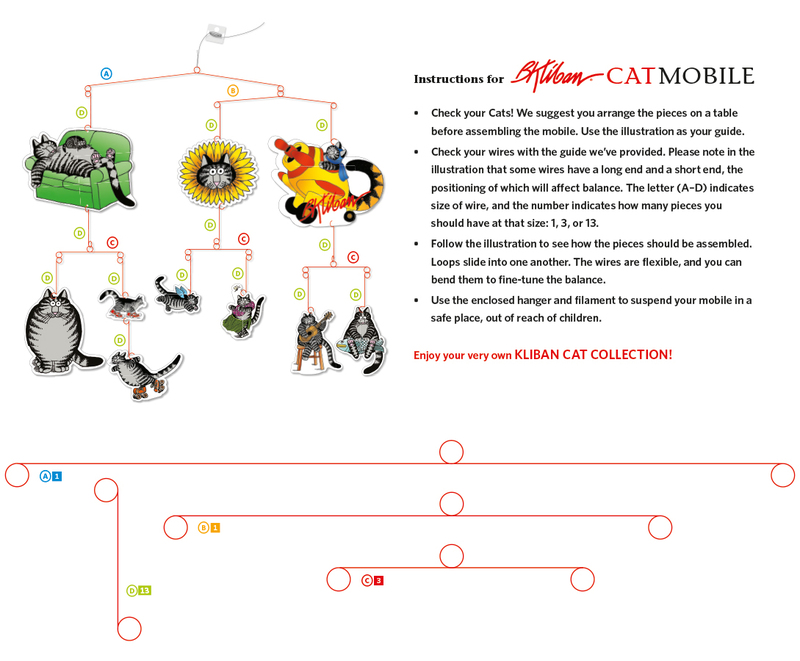 Now Kliban’s frisky feline is here to hang out with you! In this mobile, eight Kliban cartoons feature Cat in a bevy of ridiculous predicaments: sneakin’ in sneakers, strummin’ a guitar, or snoozin’ on the couch—to name a few. 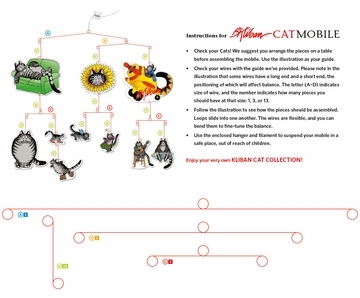 Just assemble the mobile according to the simple instructions, hang (up high, away from the kids and the kitties), then stand back and enjoy the delightful dangling display.